New Brunswick is in the midst of a provincial election, and chapters have been mobilizing in their communities to get people engaged in the issues and calling on their candidates be clear on their stance regarding fracking, glyphosate spraying, democracy and many other issues. Yesterday evening over 1000 people gathered for a rally at City Hall to push back against Ford's abuse of power and undermining of democracy and to build the collective power we will need to win. Over the summer, the Campaign to Protect Offshore Nova Scotia (CPONS) – a project of the South Shore chapter of the Council of Canadians – engaged with 18 coastal municipal councils in the southwestern region of Nova Scotia to propose they send letters to the province calling for a public inquiry into offshore drilling. The Town of Shelburne was the first to pick up on this request and call for a public inquiry in a letter sent to the Premier on September 06th. Residents who reached out to Council were displeased with the lack of public input or consultation, especially the risks to the local economy (which depends predominantly on fisheries and tourism). On Sept 8th over 250,000 people joined 900 events, in 95 countries, demanding real action on climate, towards a fossil fuel free future. Read more about N.B. What are you voting for? 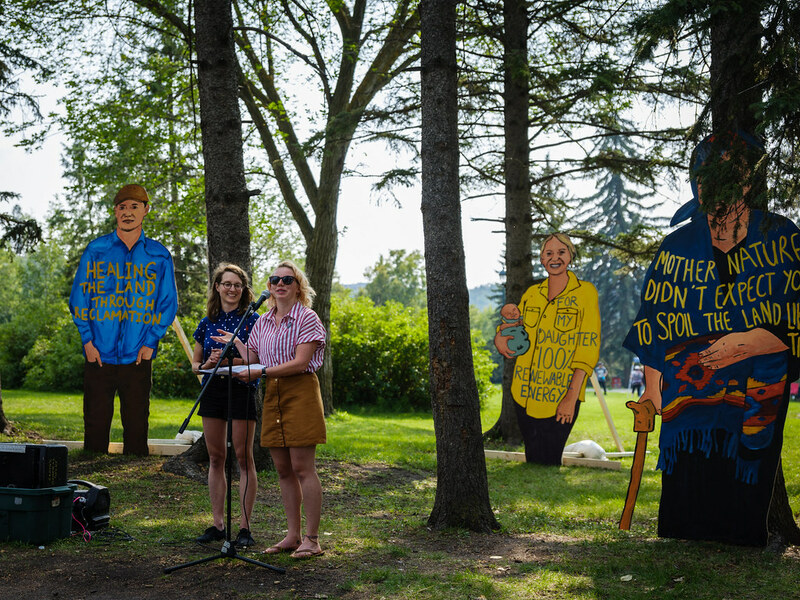 The Council of Canadian's Edmonton Chapter and the Prairies-NWT Regional office have been excited to help with Climate Justice Edmonton's “People on the Path” this summer, a series of giant portraits that will be installed in the path of the Trans Mountain Expansion Project route. According to the CBC, burgers and hot dogs weren't the only things sizzling at a Yellowknife barbecue with Northwest Territories MP Michael McLeod last week. Chapter president Lois Little attended her MP’s barbecue to share the chapter’s views of the federal government’s plan to purchase Kinder Morgan’s Trans Mountain pipeline. The day before, the chapter, along with 350.org, sent an email encouraging people to attend the barbecue, but to not have lunch with Mr. McLeod in protest of the Liberal government's plans to purchase the pipeline with public money – at a cost that is expected to soar as high as $20 billion. Pat Noonan passed away this past weekend at the age of 87. She will be fondly remembered by friends, family and fellow activists for her lifelong commitment to social justice issues. In unsurprising news, late Sunday evening the Canada-Nova Scotia Offshore Petroleum Board (CNSOPB) gave BP Canada approval to recommence their drilling operations offshore Nova Scotia, southwest of the Sable Island National Park Reserve. In their news statement yesterday, the CNSOPB states “The Canada-Nova Scotia Offshore Petroleum Board’s (CNSOPB) ongoing investigation into the unauthorized discharge of drilling mud that was reported on June 22, 2018 has determined the cause to be a loose connection in the mud booster line. The purpose of the mud booster line is to pump drilling mud into the riser to lift drill cuttings from the well to the drilling unit for processing.” They go on to list a number of steps BP has committed to ensure this particular type of accident won’t happen again. The GET council voted 4-1 to uphold its current bylaw which allows only dry use industrial businesses to locate in the township. Guelph Eramosa Township council voted on Monday July 16th to uphold its own bylaw which allows only dry use industrial businesses to locate in the township. Dry use means: Dry industries are those which do not use water or other liquids in any industrial process. Xinyi Canada declined to comment on the outcome of the council decision.